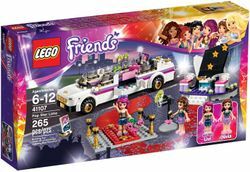 41107 Pop Star Limousine is a Friends set released in 2015. 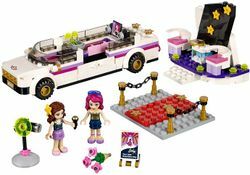 Travel in pop star style with Livi’s amazing Limo! Stretch out with Livi the pop star in her luxurious Limo. Help yourself to a drink from the mini bar while you watch TV. Look on as Livi poses for the camera on the red carpet before she meets Olivia at the interview booth to talk about her latest show. Includes 2 mini-doll figures: Livi the pop star and Olivia. Facts about "41107 Pop Star Limousine"
This page was last edited on 15 March 2016, at 05:42.